The Drama of the Ages – Mission and Mercy | "Northern Crossings"
Tonight’s sermon on Psalm 22. It is the quintessential prophecy from the psalms that encapsulates the drama of Good Friday and really the Jesus in the State of humiliation. For those who don’t remember their catechism you might want to go back and check it out. It means basically that the Son of God, the anointed one, the Christ, the Lord, empties himself and takes on the form of a servant. He is born in a stable. He is constantly tempted to take His equality with God and grasp it and shove it in the face of the devil and the world and say, “don’t you know who I am?” The life of the Savior is arduous and frustrating. The conspiracy of the leaders of the people, the inconstancy of His dis­ciples are depressingly evident. The civil realm created by God to protect the innocent turns on the only innocent man that ever lived. The ordinance created by God to bring people into fellowship with Him, the church, disowns and rejects the one who came to bring salvation. All of the orders of God are turned against Jesus. The miscarriage of civil justice, the deformation of the church that condemns its own God, the physical pain of the Passion causes Jesus to cry to His Father for help, counting on the prerogative of every child of God since Creation, namely, that God would hear. And He would not. The sinless Son of God is left to face the wrath of God because He has become the chief of sinners. It is all stark and relentlessly depressing and it is all there in Psalm 22. 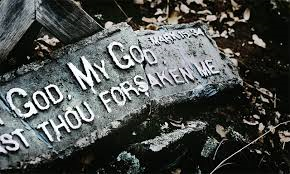 To some the “cry of dereliction”, (My God my God why have you forsaken me) is the sign of a lack of faith. We know better every temptation Jesus faced He bore up and defeated them all “for the joy set before Him”. It is all about God’s mercy to us and ultimately this is a mission text. PreviousRehearsing, Remembering, Sharing, Maundy Thursday. Hung Be The Heavens With Black..
Mercy is Being Attacked Again. Why? Fake Misery.